Just assume we have excel data and we want to plot it on a line chart with different markers. Why markers? just imagine, we have plotted a line chart with multiple lines by different colour, but we only have black and white ink, after printing, all lines will be in black colour. That’s why we need markers. For instance, our data can be seen in the Table above, this data about algorithms performance vs. the number of k. I want to plot this data to the line chart. We already have the previous experiment, how to plot the line chart with multiple lines and multiple styles. However, in the previous experiment, we used the static declaration for each line. It will be hard if we have to declare one by one for each line. Let’s just start to code.. The first step is to load Excel data to the DataFrame in pandas. It’s very easy to load the Excel data to DataFrame, we can use some parameters which very useful such as sheet name, header, an index column. In this experiment, I use “Sheet2″ due to my data in the Sheet2, and I use ”1″ as the header parameter which means I want to load the header to the DataFrame, and if you don’t want to load it just fill it with ”0″. I also use index_col equal to “0”, which means I want to use the first column in my Excel dataset as the index in my DataFrame. Now we have a dataframe that can be seen in the Table above. Now, we have a list of markers inside the ‘markers’ variable. We need to select the markers randomly which are defined by df.shape (the number of columns). Let start to plot the data. Sometimes we need to plot multiple lines in one chart using different styles such as dot, line, dash, or maybe with different colour too. It is quite easy to do that in basic python plotting using matplotlib library. Let’s go to the next step, several lines with different colour and different styles. If only three lines, it seems still easy, how if there are many lines, e.g: six lines. Now, we can plot multiple lines with multiple styles in one chart. I am a lazy guy, when I already have my setup environment, it is hard for me to move on. In my lovely MacBook, I had Python with python virtual environments (virtualenv), of course, one of my virtualenv has a complete data science libraries. I used this virtualenv when I want to do data analysis. I also had experiences using docker-machine to be more productive and reproducible in analyzing data but it is heavy so I keep using virtualenv. I have heard about Anaconda or conda which is the platform that bundles all data science libraries to one plate and you just enjoy it, but I never tried yet. Still, it is hard to move on. Then, after I have a new computer in my office and it is Windows. I wanted to start working with data using Python in my computer and I tried to remember what steps I have to do? Installing Python, installing PIP, installing virtualenv, installing virtualenv wrapper, installing all data science libraries to one of my virtualenv, and start working. As the lazy guy, I do not want to do that. I went to anaconda website and I decided to try Anaconda and tarrraa!!!!!!!! Just go to https://www.anaconda.com/download/ download the installer which matches with your operating system, install it then launch the Anaconda Navigator. It was surprising me, I even can run Rstudio using Anaconda Navigator. If you enjoy using Jupyter (IPython Notebook), you just need to press launch for the Jupyter. It is also supported by one of beautiful IDE to do data analysis in Python which is Spider. It is really cool. Previously when I used R, I always use Rstudio as my IDE to do data analysis and now if you want to move to Python, you can use a similar IDE which is Spider. I have been two years doing processing and manipulating data using R and mostly I use this language for my research project. I only heard and never tried Python to analyze my data before. But now, after I use Python, I really fall in love with this language. Python is very simple and it is been known that this language is the easiest one to be learned. The reason why previously I used R was this language supported by tons of libraries for scientific analysis and all of those are open source. Now, with the popularity of Python, all libraries that I need, I can find it easily in Python and all of them open source as well. SciKit-Learn, when you want to apply machine learning on your data analytics. Scrapy, to scrap the data from the internet, when you want to gather the data from websites for your analysis. I used tweepy library to collect tweets data from Twitter. NLTK, if you want to do natural language processing. Theano, Tensorflow, Keras, when you are not satisfied with NumPy performance or want to apply neural network algorithm or doing deep learning stuff, these libraries are very useful for it. Interactive Visualization Tools, matplotlib is basic plotting tools and it is enough for me as researcher especially for publications, but when you want a dynamic plotting or more interactively you can use Seaborn, Ploty, or Bokeh. If you are a lazy guy like me to install all the stuff above, you can try to use Anaconda, it is really cool. 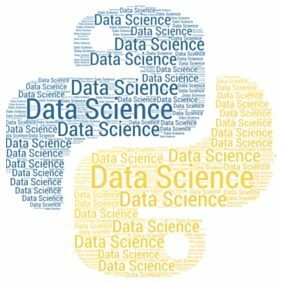 See ya on the next post..
Berikut adalah Python for Data Science Cheat Sheet yang cukup membantu untuk merefresh ingatan kita atau bagi yang baru awal menggunakan Python untuk analisis data, mining data atau data science bisa dijadikan bahan bacaan. Cheat Sheet di atas saya dapatkan dari DataCamp.